The best moments in the day are the ones spent with baby, so make the most of precious time with Graco�s DuetSoothe� Swing + Rocker. This ingenious swing has a seat that doubles as a rocker, giving you the flexibility to move around the house while keeping baby cozy and close-by. In swing mode, three seating positions give baby the option to sway side-to-side or swing back-and-forth � whatever he prefers! 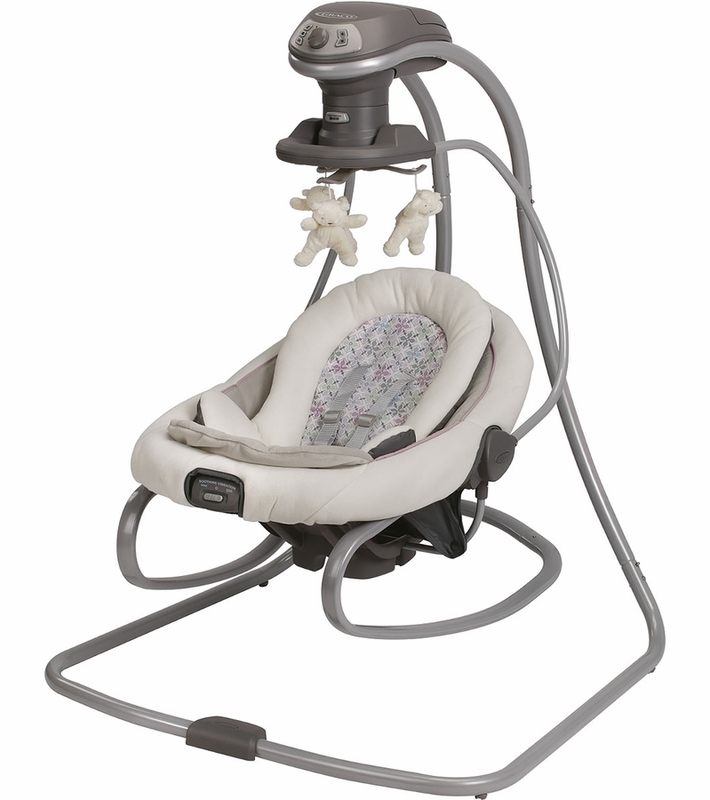 With added features such as a plug, vibration, and music, the Graco DuetSoothe� Swing + Rocker has all the options baby will love. 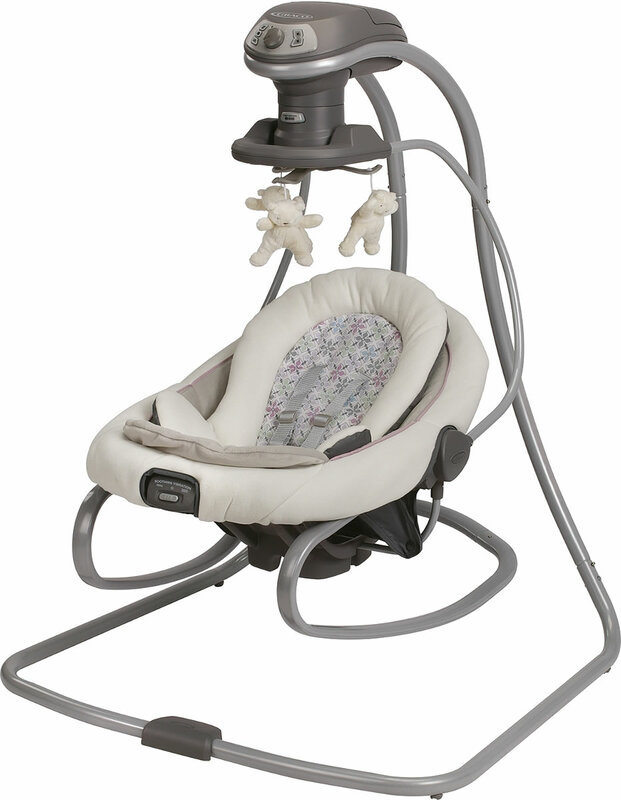 Rocker: For babies from 5.5 to 25 lbs. I sent this to my daughter and son-in-law who are expecting their 3rd baby. They put it together in a snap and their only complaint was that they have to buy batteries (if you call that a complaint) for the vibrating effect. My daughter LOVED that the seat can be removed and moved about the house easily. She also loved the fact that the swing can be rotated and used for side to side motion in addition to the usual back and forth direction. It looks comfy for a newborn and fits nicely into their home decor. Pros1. Seat can be removed and used as a stand alone making it easier for mom and dad to keep an eye on baby 2. Seat can be rotated for side to side swinging in addition to back and forth. 3. Multiple sound choices. 4. Vibration available on seat 5. Easy to assemble 6. 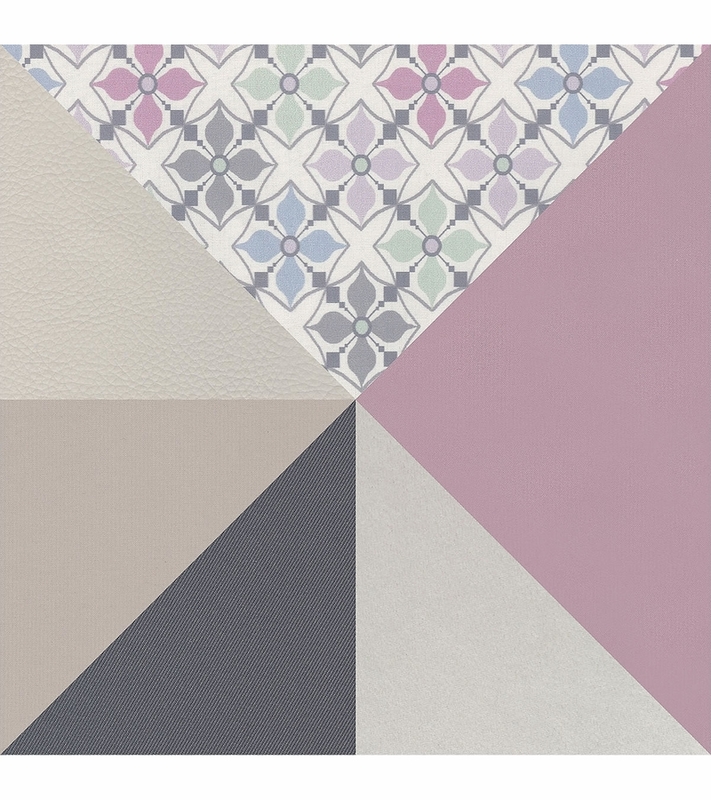 Neutral design makes it good for a boy or girl. ConsBatteries for vibration are not included. Great swing but when it swings side to side it hits the bars behind it. One of my first purchases for my sencond child. A good swing is a must. I loved how you could change the direction of the swing by swivelimg it around. Has a lot kf choices for speed, music, and the saleat vibrates too. Whole chair comes off, i bring it in the bathroom when i shower to have baby close by. We bought 2 of these for our twin boys, they loved them! We received this swing, different colors, for our first son (now 2) and we used it constantly. It was a lifesaver. The different directions, vibrations everything facilitated keeping baby happy or sleeping in the wee hours of the morning. We just had our 2nd son a few months ago and our trusty swing has been amazing. Until this morning. It just up and quit. Its plugged in, the cords are in tact but the power light wont turn on and the motor wont push the swing. I am so, so sad. Just like his brother, he wakes up super early and only likes to be in his swing til an acceptable hour for the rest of the house to be up. Maybe we just wore it out, I dont know. Rest assured though, if you buy this swing you will get many, many, many hours of use out of it. I sent all of the requested info to a Graco, so this should be covered by warranty since we only purchased it 3 months ago. It suddenly stopped working. My son is only 15 pounds. Based on reviews, this happens a lot. Looks really comfy, but this motor seems to mess up a LOT. I've had 4 babies- the other three are now older so I had to purchase a new swing for baby 4. I had no issues with other makes and models of swings. I cannot seem to get the cover off so it can be washed! We used this item with our first son and then bought a second one, so we had two for our twins. These are great for getting babies with colic, reflux, etc to sleep. They were definitely a must have for us. It definitely does it's job soothing my baby and it's his main napping place during the day. However, it clicks very loudly and has started to make almost a squeaking or creaking noise, and it's very loud! I'm glad he can still nap even with the noise but it is ridiculously annoying for me! We just got this darn swing, and since day one we have a hard time getting it to work. You have to play with the wire to get it to power on. When we get it to work it will not swing. So upset. We have everything graco and i stand by those products. This swing makes me sick. Our daughter was born December 22, 2017. Today is January 15, 2018 and the sw ing no longer swings. Very disappointing!! The concept of the entire swing is great. The thing that makes me give this 2 stars is the noise level of this swing. When the swing is rocking, it is so loud (no matter what level it is on). Also, the vibrating is just as loud, if not louder. I'm not sure how my son can sleep in it. I am very disappointed in this swing. This is my 3rd kid and I have only used Graco products and this swing is a disappointment. I wish I choose a different swing. We bought this for our little girl and have only used it no more than 5 times and the motor has already started to go out. I put it on 6 and it is acting as if it is on level 2. VERY disappointed and will not buy a graco product again. My daughter is 2 months old, I got this as a gift at my baby shower. Even on the lowest setting of the swing, it clicks while swaying back and forth. I like the concept of it being able to separate as a bouncer but the noise is horrible!!! I don't know how a baby wants to hear all that or even the family in the room. It makes me not even want to use it. Does the mobile move or is it just stationary? Mobile seem s to just hang there and doesn't move when swing is swinging. GREAT FEATURES, THANK YOU, GRACO TEAM!!! 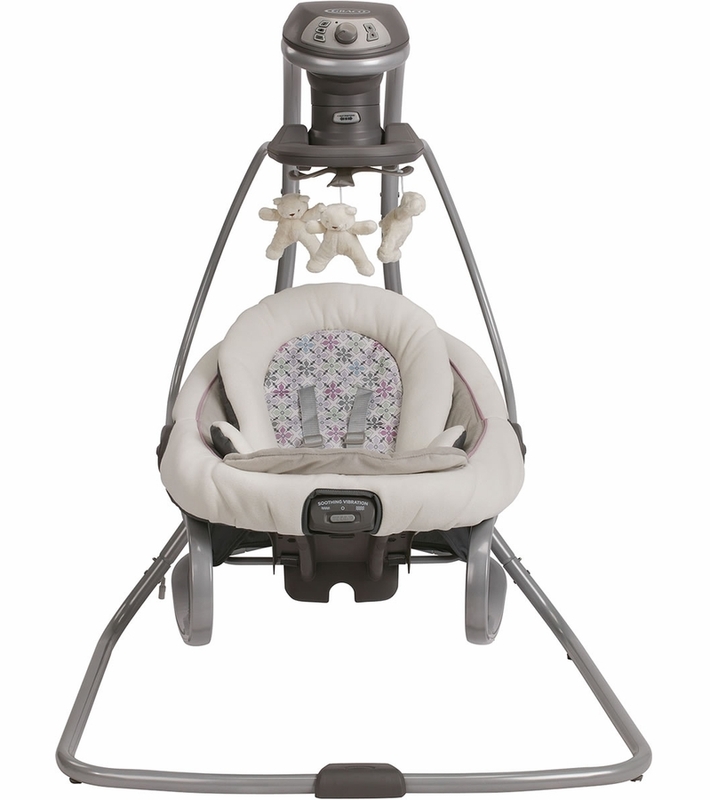 I LOVE MY GRACO DuetSoothe�‚® Swing + Rocker! SO MANY NICE FEATURES AND SOFT MATERIAL. ALSO FOR THE HARNESS I BOUGHT SOFT PADS FOR BABY SHOULDERS FOR MORE COMFORT. WITH THE PREVIOUS BABIES WE HAD VERY SIMPLE CHEAP VERSIONS. The rocker is great but the motor is not. Our baby is not even 2 months old and the motor is already struggling. Is the vibration unit runned by batteries? Its starting to go on mine and I would like to correct it if possible! Otherwise I love this swing! We have received this product couple of days back and put it all together. In my experience, it seems sturdy for a child and runs great. It definitely seems worth the price for the comfort of child and new parents. However, I'm not sure if it will last for more than one children given framework does not seems like it can take beating of some storage. This was baby given as a baby shower gift! It is wonderful! Best All in One Swing! Recieved this as a gift and my son is six months old and still uses it daily. The are so many different options your child is bound to fall in love with it. I love that the base detaches so you can move it to another room with ease. All around a great swing. Used this swing for four months with my son! He loved it, helped me be able to play with our other son and sometimes was the only place he enjoyed to sleep at. I bought this swing because it was a 3 in 1 and i am limited on room in my house. I couldn't be any happier. I love how easy it is to use and switch between functions. I bought this swing because it was a 3 in 1 and i am limited on room in my house. I couldnt be any happier. I love how easy it is to use and switch between functions. 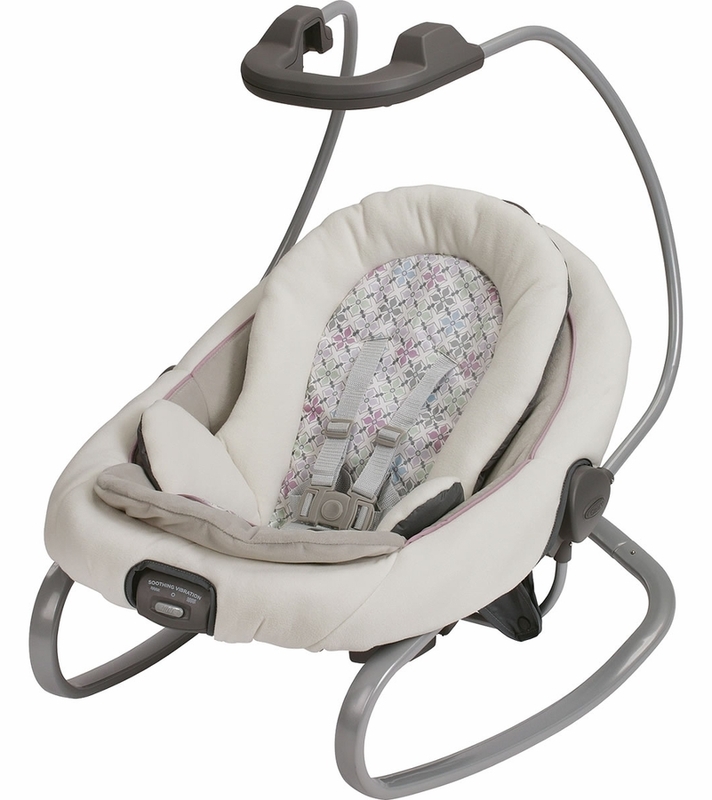 Graco is a name I have respected for decades, which prompted the selection of the DuetSoothe Swing + Rocker. As new grandparents, we wanted the best for our first grandchild. For the first time, he is soothed, quiet and not in someone's arms. The music is pleasant background music for us as well as him. Please consider adding a USB port option to enable parents and grandparents to offer music options. Our grandson loves Irish tavern music. Picked this out as a way to have nothing a rocker and a swing and save space. Perfect size and even better quality. Love the multi speed swing setting and seat vibrations. Great product. Very happy with purchase of this swing! Albee Baby is the only place where I was able to locate this swing in the "Kendra" pattern. My daughter in law and son were thrilled to receive it! Very fast shipping as well. We just put this together. First Grandson due next month. Cant wait to see how he likes it! It was challenging to put together but we love it! So very quiet!! We just put this together. First Grandson due next month. Can't wait to see how he likes it! It was challenging to put together but we love it! So very quiet!! I bought this for my grandson and he loves it. The swing rocks different ways and plays music. I put on the vibrating mode and his face was full of wonderment. As a newborn he loves to sleep in it and not on momma. Momma loves it too, gives her freedom to move about without having to hold baby. With the safety features she is assured that baby will not fall out. My baby is not comfortable in it....I don't feel like keeping my baby in it as it's so shallow....I am stuck with this product. My son isn't even 2 months old yet and the swing has stopped working. He is only 12lbs, which is no where close to the 30lbs weight limit. My son loves the swing and I'm very disappointed that I paid so much money for a swing that broke that soon. I haven't called yet, but I expect a new motor to be sent to me free of charge or I will not buy another graco product. We love this swing. We can put our newborn in it and carry her around the house while we do things or leave her swing for a little to help her calm down in a fussy time. Just a great product. We love all of the features! We bought this to have at our house for our Granddaughter. My husband put it together & realized the AC adapter was missing. I called Graco. Their customer service was great! We received an AC adapter 2 days later! My Grandaughter came to visit that week and loved it! The swing is great, love the color, love the features, but the base is really big, barely fit through the doorway of the nursery. Also, didn't come with the animals that were in the picture that I purchased? But it soothed the baby to sleep and that was the main goal. We were worried this product would take up too much space in our living room but it isn't as large as we thought and still does a great job of swining our little one. I love the feature to detached the seat so if you need to bring it into another room it makes for a simple transition. I would recommend this swing to other parents. It has several swing speeds and can be turned to swing from right to left or back to front and the chair has its own set of movement features. You can find the right one to help comfort your little one. Love everything it does ! I bought this for my newborn and he fell in love with it. He got so used to being in it that he starts crying if he doesn't go to sleep in it ! Our baby is teething, so she does not want to be put down more than usual. We bought this, so I may be able to do other chores still. It works. Our baby was awake when I put her in the swing, and she eventually fell asleep on her own. The reasons why I did not rate this product as excellent are following. There was a part in the assembly where it just wouldn't snap together properly, as in the metal was scraping the sides of the plastic. Also, the metal base itself is difficult to transfer to other rooms, since it does not easily go through doors if it's upright. I bought this product for my first born. The swing and rocker are both great! I like that I can detach the rocker and move it anywhere in the house. It's great to have so many sounds options as well! I like the multiple swing angles and easy to change between swing and rocker to bring around the house. Received this as a shower gift. Very simple to use. Baby loves the swing! Only things I would change is the vibration only runs on batteries no option to plug in. Battery life seems to be pretty good though! Received as a baby shower gift and I'm glad we did!